Killer Characters: Aunt Ophie has a Giveaway! Aunt Ophie has a Giveaway! It’s been a while since I had a chance to stop by and say “hi, y’all”. My name is Ophelia Elizabeth Brice McLennon Honeywell. Most everybody on Fort Myers Beach calls me Ophie, although I do like it when handsome young men, like those sweeties from the sheriff’s department or that sandy haired reporter, call me Miss Ophelia. I am sure you know that my niece Bridgy Mayfield and her friend, Sassy Cabot, own the fabulous Read ’Em and Eat Café and Bookstore. I try to push them into finding beaus and settling down but you know these modern young women. For now at least, it is all about running their business and solving the occasional murder. Yep, I did say murder. Instead of dating the handsome young deputies, Sassy and Bridgy have a less than seemly relationship with the sheriff’s office Dead body here, murderer there. What’s an auntie to do? I try to keep the girls out of trouble and believe me that is a full time job and often takes me away from my delightful shop, The Treasure Trove, which is chock full of local art and eclectic consignment items. You really should stop by when you are here at the beach. It may only be mid-May but the lazy days have come to Fort Myers Beach. Temperatures in the 90s nearly every day. It certainly makes me appreciate the lovely breeze that comes in off the Gulf of Mexico and sweeps across the island to Estero Bay. I love to sit on my lanai in the evening and plan the next day’s events. I like to use pretty paper and a nice pen—helps me put into words the lovely thoughts rambling around in my head. This is the kind of notepad I often use. And now you have a chance to make this summery notepad your very own by commenting below anytime up until midnight your time on Tuesday May 22nd . Please include your email in this format: your name (at) your server (dot) com--so the spambots can't pick it up. You might tell me what you would use the notepaper for, but that isn’t necessary for a chance to win. And if you want to spend more time with me and the rest of the folks from Fort Myers Beach, you can always visit us in the Read ’Em and Eat books: Well Read, Then Dead, Caught Read-Handed and Read to Death. I use whatever I have. Usually it is a receipt. I would love to have a lanai to sit on, listening to nature and feeling the breeze. How relaxing and comforting they are! Unfortunately, I don't live in Florida anymore. Indiana is not lanai country! Such a cute giveaway! 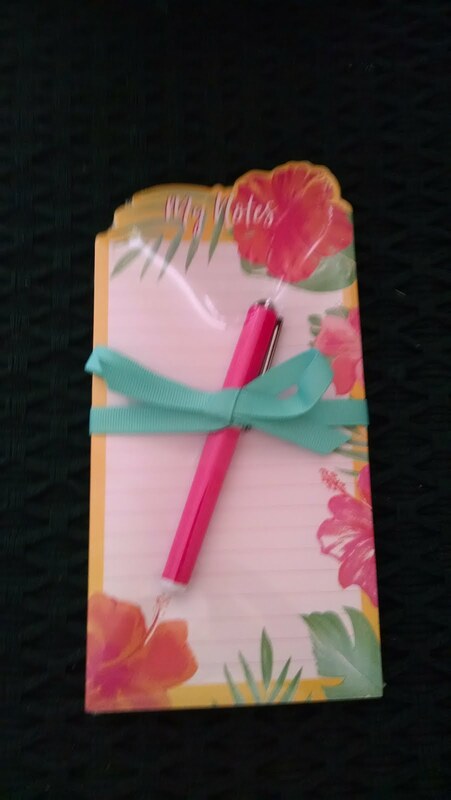 Love notepads, use them all the time! I'm always making notes to myself so I don't forget what I have to do or appointments I have. I like a pretty notepad to keep me on track. Thank you. I'd love to spend more time with Aunt Ophie and the Read ’Em and Eat Café and Bookstore! Lovely set of paper and pen. If I were fortunate enough to be selected, I'd use it to write to my Mom. Actually it's my hubby's Mom but we have no in-laws in this family. :) She is 88 years old and lives in another state. She's also very hard of hearing which makes talking on the phone very difficult. She enjoys getting mail and reading to catch up on what's going on in the lives of her loved ones. I'm sure she would enjoy reading something from such lovely paper for those quite catch up moments. Thanks for the chance! I make lists...things I need to buy, things I need to do, things I need to pay, appointments,shows I want to watch. So many things I need to write down. I love the books with blank pages especially the ones with lines. Use them for everything. Thanks to everyone for hanging out with Aunt Ophie for a bit. Giveaway is closed. Winner has been notified. See you next month!